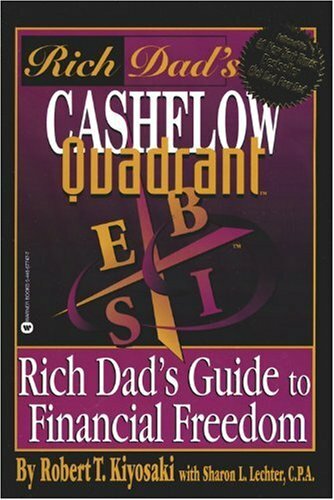 The follow up to Rich Dad, Poor Dad, released in the year 2000 and once again co-written with Sharon Lechter, Cashflow Quadrant is a personal finance book where Robert Kiyosaki introduces a concept of the same name as the title of the book. A cashflow quadrant according to Robert Kiyosaki is a grid with four boxes with each box identified by a letter. The letters used are E, S, B, and I, which stands for employees, self employed or small business owners, business owners not directly involved in the day-to-day operation of the company, and investors. Robert Kiyosaki expresses in Cashflow Quadrant how each quadrant has different ideas, views and perspectives of money. Each quadrant, thus, is characterized by different concepts as they relate to money, business, and taxes. Robert Kiyosaki explains how employees have a job and work for someone else, a self employed person owns a job, a business owner owns an asset with produces money and cash flow, and investors have their money work for them. In Cashflow Quadrant, Robert Kiyosaki uses personal experiences to identify the differences of each quadrant, and touches back on all the key concepts of Rich Dad, Poor Dad, in a repetitious way that is intended for readers of both books to have everything learnt reinforced. Again, Robert Kiyosaki is about financial literacy, and repetition is a great way for ideas to stick. In Cashflow Quadrant, you learn how the role you play, the quadrant your classified in will ultimately determine your financial freedom.